Good morning! Oh, thank Heaven it's Friday!!! It's been a crazy week for me, and I for one am looking forward to the weekend. I don't think I'm alone and I'd be willing to bet there are a lot of us out there!! If you're looking for something creative to do this weekend, why not join us for the Peachy Keen Challenge this week? Challenge #21 is "You've Been Framed", and that means that you can create anything your heart desires as long as it's in a frame, or includes a frame. Here's what I came up with for this wonderful challenge. 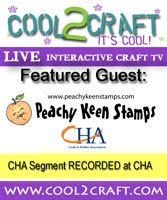 Be sure to stop by The Peachy Keen Challenge Blog to check out all the wonderful creations from my fellow DT members. They totally ROCK!!! While you're there, read up on the rules for the challenge, THEN run... Don't walk... To your craft room and see where creativity takes you! Thanks so much for stopping by today! May God bless and keep you today and always! Happy Stamping!! This is SOOO SUPER CUTE! I love the papers, those cute bone buttons and of course that adorable pup! This is such a great project! You should keep that Cricut and Gypsy dusted off more often! LOL! Have a great weekend! Great project!! I love that dog face stamp!! That set is definitely on my wish list now!! Love this! Been wanting to revamp my treat jar for our 4 month old sheperd....thank you for the inspiration!! WOW! The colors on this are just astounding! Love that little pooch so much!